A recent report released by Mozilla indicates that about 20 to 40 percent of phishing attacks get through the anti-phishing measures that Firefox 2 and Internet Explorer 7 have implemented. The testers found that with IE7's auto-check turned off, the browser blocked less than two percent of all phishing sites thrown at it. With the phone-home option turned on, IE blocked 66 percent of the scam sites. In its default configuration, Firefox 2.0 blocked close to 79 percent of all phishing sites during the test period; with the "Ask Google" option enabled, Mozilla's browser blocked nearly 82 percent of all scam pages. While it isn't apparent how PhishTank's blacklist stacks up to Mozilla's and Microsoft's, its open framework makes it more adaptable to detecting the latest phishing sites. With the SiteChecker extension, you can double your protection in Firefox. 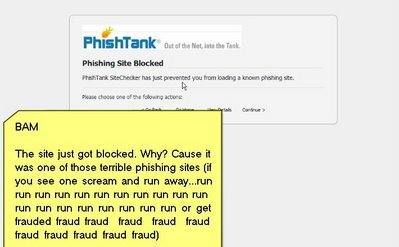 If you hit a suspected phishing site, you should see Firefox and SiteChecker competing for your attention. To check that it's working, go to this page. For Opera users, a Greasemonkey script is available. Update: As noted below, the new site is located here.